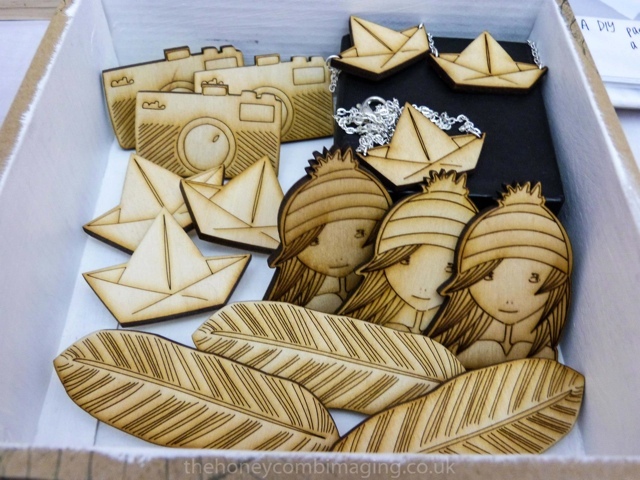 Today Hannah Marshall of Maker's Boutique tells us how to sell products through high street shops, retail outlets, galleries and exhibitions. She'll help you to understand what this entails, what to watch out for, what you can expect from stockists and what you need to deliver to be successful, plus some super top tips. 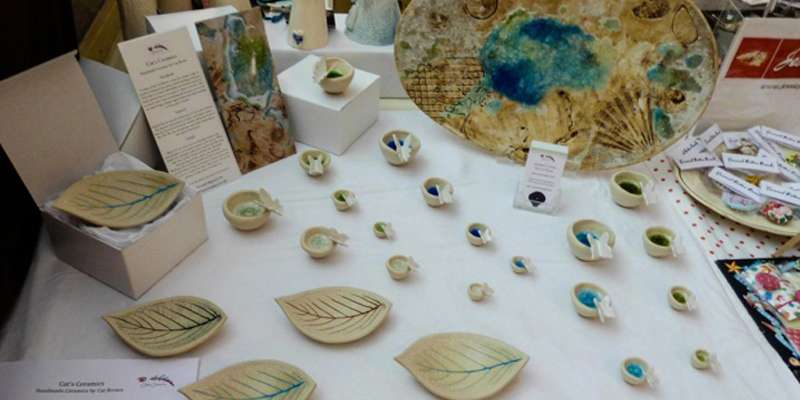 You can check out Hannah's previous blog to see more on How To Sell At Craft Fairs. Selling in a retail environment for the first time is very exciting. This can happen through various outlets; shops, galleries, exhibitions and even high street shops. It is the perfect way for many artists to sell their work if they are uncomfortable or shy selling it themselves, as many creative people tend to be. It is an ingenious way to have your work promoted and sold for you, so you can busy yourself with your favourite activity - making stuff! This process is very simple; it basically involves you parting with your wares on a Sale or Return Basis, or buying your stock upfront (scroll down for explanations). At the end of the day people are not going to sell your work for free, so this comes at a cost! You need to be making a profit from your work so sometimes this doesn’t work for all artists. Materials, time spent making the items and other costs like studio expenses, postage, insurance and packaging all need to be taken into account. Look at commercial websites online and see what people doing similar work or crafts charge. Below I have outlined some of the expectations, common situations and questions artists have when first selling this way. At the end of the day there are many ways to approach and submit work. Different organisations have different ways of dealing with new submissions so it's all down to their procedures. I have tried to cover all bases below, but it is always a good idea to ask what their procedure is first, before bombarding them with information that may be irrelevant. Usually a short biography and a link to a website is enough. A shop or gallery may contact you in person, which is great, but how do you find a place to stock your work if no one has contacted you? One of the best ways is to investigate local outlets and speak to the owners. Never, ever approach them if they are busy with a customer though! Bring examples to show them or photographs if your work is large. Sometimes they may take your work there and then if you are speaking to the right person. Others may have a criteria for applying with a jury. You can find galleries and shops online by searching for them on art & craft directories like UKHandmade, the Crafts Council, Arts Council and A-N.
Another good format that has worked well for me in the past is to use the power of Google. Search out artists who fit your brand (not similar work to yours, as they won’t want duplicate stock), see where they stock their work and email those outlets. Another good tip is to Google galleries in affluent areas! Think about where your work would be suited. If you do urban art, seek out specialist outlets, if your work is inspired by the coast, seek out seaside-based establishments. Never send out spam. Tailor each email to fit the stockist and explain why your work would be a good fit. If you have had good sales, tell them. If you think your work fits their brand, tell them. Give them an outline of yourself and what you make, with a link to your website. Don’t attach giant files that will bounce or be blocked from their email account. Follow it up with an email if you don’t receive a response straight away - many owners are busy and emails can get quickly overlooked. An exhibition is a short term selling space that can be equally lucrative with the right promotion and audience, whether you are part of group or putting on a solo show. You can either put your own show on, or get someone else to do the hard work! Exhibitions used to be reserved for established artists where the artists were guaranteed to bring in sales due to their track record in a short space of time, and although this is sometimes still the case, many galleries still take a punt on upcoming talent. You can email galleries directly using the technique I outlined above or try checking online directories and listings. Usually artists are headhunted by the buyers who are looking for something that fits their trends that season - pretty elusive people to get hold of! You may need to email a company to find out who you should contact if you cannot find their details. One of my favourite stories I heard was that one of the owners of the famous ceramic company Troika took the train from their studio in Cornwall to London to show his wares to the department stores like Liberties and Heals. When he was told there was no buyer available he promptly sat down and said he would wait. When a bemused buyer eventually came out to meet him they fell in love with his work, not to mention his self-belief, and the rest, as we know, is history! What Does Sale Or Return Mean? When dealing with Sale or Return (SOR) most galleries and shops charge 30-50% commission. Rarely some charge upwards of this - for example, very high-end establishments will take your base price (wholesale) and mark this up to anything from 2.5 to 3.5. They will either ask for a wholesale price and mark it up, or an RRP (Recommended Retail Price) and take commission out. Make sure this is clear before you proceed. What Does Having Stock Bought Up Front Entail? 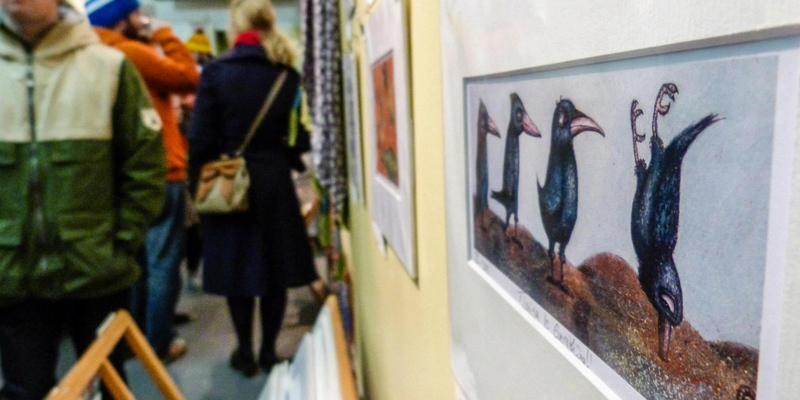 Unless you make something small, inexpensive and desirable like cards, galleries and shops do not usually buy stock upfront unless you are selling at a trade fair, which is a very expensive way round it. But, if you don’t ask, you don’t get! More famous artists or established ones may get this honour after successful years of trade. If you want to tackle the high street and big shops that do buy up in wholesale then bear in mind your stock will be bought in massive bulk after months of careful planning by the buyers and your work will be required at a significantly lower margin than your usual wholesale for galleries or shops. If you are thinking of approaching retailers like this think about whether you have the time if your item is handmade, or the energy, to make 500 or 10,000 of your items. It may seem very exciting at first but from speaking to people that have done this is it very time-consuming and stressful and can sometimes lack the creativity involved in being an artist, as you will turn into a production line unless you are supplying artwork that will be duplicated. The stockist will be expecting exclusivity so this can’t turn up on a mug at your next craft fair! Heavily detailed contracts will need to be signed outlining what they will be expecting. A common misconception with artists is that retail outlets charge extortionate commission or mark work up absurdly. In my experience the more commission a gallery charges, the more you will be making in sales. What an artist does not understand is the incredibly high costs involved in running a gallery. Rent, business rates, water bills, electricity, phone lines, internet, staff, insurance, furniture, displays, packaging, advertising and promotion cost a lot. On top of that the owner has to be making a profit to pay their own wages. In high-end galleries and high street shops there are even more expenses involved in selling, like funding private views, brochures, booklets and websites, to name just a few. If sending overseas you should always get stock paid for up front. If this is not possible a contract must be signed to outlay the responsibilities of the stockist. As you have sent stock out of the UK you can wave goodbye to any legal action you can take in the circumstances of non-payment unless a binding contract is certified. You will need insurance in place for this type of selling. Stockists will expect you to provide them with your work, of high quality, with a stock sheet outlining all your items. They will usually sign this and return it to you for your records. A contract may need to be signed for exclusivity or terms and conditions of selling. Packaging is usually expected, like boxes or presentation cards, but check whether they want it branded or unbranded. Most stockists don’t mind promoting the artists by name but they don’t want customers visiting your website and losing sales, especially if you have undercut them and are not selling your items for the same price as them. You have to understand that business is business and every sale matters to them and keeps them afloat, and by keeping your prices the same you are actually benefitting from more profit when selling the items directly yourself. Galleries will usually take custom orders too, sometimes at less commission, so find out if this is a possibility if your work has options or variations in colours or size. You should usually post the items out at your expense, unless otherwise specified. Returned items are usually the stockist’s responsibility. The most important thing is to find out when payday is! This should be in advance if buying up front, or if dealing with SOR every 1- 3 months or whenever the owner gets round to it! Make sure this is clear before you proceed. You will expect your items to be carefully and thoughtfully displayed so find out what their ideas are about merchandising your stock. Find out about insurance in case of theft or damage. Most static shops will have this in place but temporary places like exhibitions will not. Don’t just pick anyone that will have you! Carefully select your outlets. Just because they will take your stock it doesn’t mean they are passionate about it. You want people selling your work who love it as much as you do, otherwise, it may take a back seat. Be professional. Make sure your stock and packaging is top-notch! 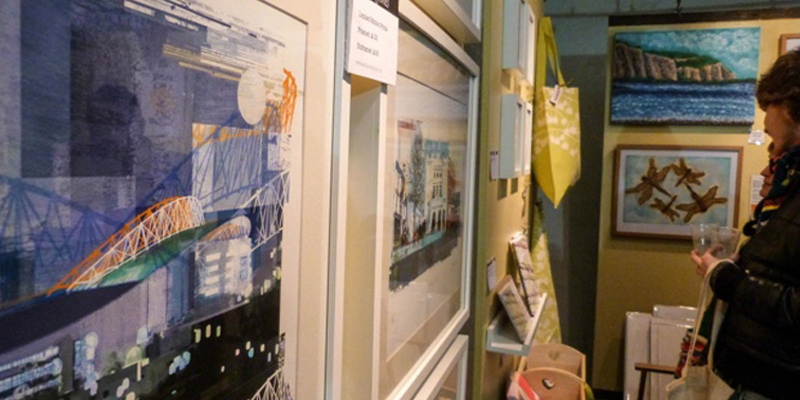 Customers will be expecting quality when shopping in a gallery, shop or exhibition. Stay in touch! Most places are very busy but stay in touch if your work is SOR to find out what's selling or not selling and what customers are saying about your work or how they are interacting with it. Don’t leave it months on end if you haven’t heard from your stockists. They are around their customers all the time, day in, day out. Don’t be upset if they offer suggestions that in your mind seem rude but after careful consideration and compromise may actually make you more money! Know when to walk away. If it doesn’t work, then cut your losses and try your stock somewhere else, unless you are tied into a contract. If it's not selling there it may sell somewhere else. Sometimes the places you think that will be great for sales are not, and the places you think may not will turn out to be your top stockists! Don’t be scared of rejection! If someone doesn’t like your work it is nothing personal; everyone has an opinion. They may have stock like yours already, they might have unsuccessfully tried work like yours before or it may not be right for their target audience. You want the person selling your work to be equally as enthusiastic about it as you so your products are pushed well and make you lots of sales! Photography from the Maker's Boutique exhibition at Brighton fishing Quarter by Adam Bastock at Honeycomb Imaging.